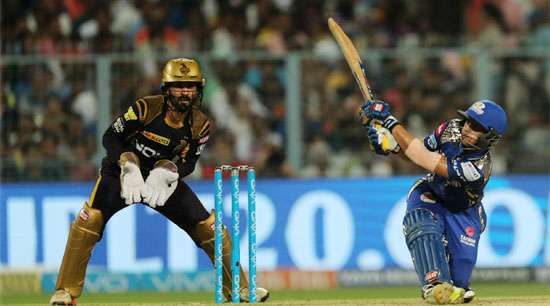 Kolkata, May 10: Mumbai Indians rode teenage wicketkeeper-batsman Ishan Kishan’s 21-ball 62 to record an emphatic 102-run victory – the largest margin in the ongoing edition of the Indian Premier League (IPL) – over Kolkata Knight Riders at the Eden Gardens here on Wednesday. The win, Mumbai’s third on the spin, took Rohit Sharma and Co. level on points with Kolkata (10 points from 11 games) and fourth in the points table courtesy a better net run rate. Kolkata, who lost to the same opponents in the space of three days, dropped a rung to fifth. Mumbai, who remain in the reckoning for the play-offs, have now won 18 times, and eighth on the row, in 23 meetings with Kolkata. Coming to Ishan, the Jharkhand left-hander’s pyrotechnics between the 10th and 15th over fetched Mumbai 73 runs as they posted a mammoth 210/6. In reply, Kolkata were shot out for 108 in 18.1 overs. Kolkata were never in the chase, losing wickets at regular intervals. Chris Lynn (21) and Nitish Rana (21) were the top-scorers as Mumbai effected two run outs with Pandya brothers Krunal (2/12) and Hardik (2/16) returning best figures. Earlier, Ishan was all blitz as he tore into celebrated India wrist spinner Kuldeep Yadav 3/43), smacking him for four successive sixes and taking 25 runs off the 14th over. Three overs earlier, Ishan had underlined his intent by hitting Piyush Chawla (3/48) for 14 runs which included three fours in the 11th over. Ishan and skipper Rohit Sharma (36; 31b; 2×4, 1×6) were involved in a 82-run partnership for the third wicket off just 34 balls which proved to be the game changer. Rohit was dropped by Nitish Rana on 10, when the team was on 90/2. In the end, Ben Cutting’s 9-ball 24 took MI past 200 as the last over went for 24 runs off Piyush Chawla (3/48). Openers Evin Lewis and Suryakumar Yadav gave MI a decent start. Lewis was dropped by Kuldeep Yadav running backwards from square leg off Prasidh Krishna (1/41) when he was batting on 16. But the 26-year-old Trinidadian could not make the most of the reprieve, getting out in strange fashion trying to pull a loose Chawla delivery with the ball ballooning off the back of his bat to short third man where Chris Lynn took an easy catch. Lewis and Suryakumar stitched together a 46-run stand for the opening wicket as Mumbai were 47/1 at the end of Powerplay. Former Kolkata player Suryakumar who has been Mumbai’s batting mainstay this season, then threw away a strong start, pulling a Chawla half tracker to Rinku Singh at deep midwicket. Ishan finally fell trying to clear the deep square leg boundary just after hitting a six but picked out Robin Uthappa. Hardik (19; 13b; 2×6) and Rohit departed in quick succession with the latter giving Prasidh Krishna his first IPL wicket.